Boy, talk about leaving things to the last minute. This post is for Dom at Belleau Kitchen's Random Recipe challenge. Dom challenged us to make a recipe from a random cookbook, but this time he added a twist. The cookbook had to be Number 18 on our shelves. The first time I counted out,from left to right, I landed on the Complete Cookery Course, and the recipe I opened up to was a tuna recipe. Now, one of the not very nice things about living in a land locked province, is the lack of super fresh fish. Unlike, say, Mangalore or Hoylake, both of which are right on the coast, its much harder to source fresh fish here in Alberta. I have heard whispers of a convoy of fish from Slave Lake, but haven't been able to track down so far. Our fish, therefore, comes from Terrace, where in the summer Kay and his brother go out fishing on the Skeena River, and catch salmon, which we then freeze and transport down here. It tends to be mainly different kinds of salmon or maybe some trout. Anyway, to get back to my point, fresh tuna steaks are practically impossible to find under budget. I saw a Billingsgate Fish Market here in Edmonton, and got all excited, thinking it would be like its namesake in London. But was slightly disappointed that it was quite small, and a lot of the fish was frozen. They had some nice fresh fish, but I reasonably couldn't justify paying over $35 for two decent sized tuna steaks. So it was back to the cookbook shelf for me. 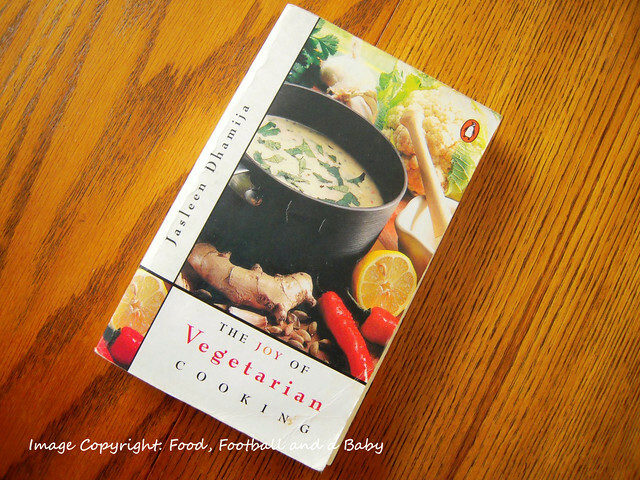 This time, I counted right to left, and luckily for me the book that showed up was Jasleen Dhamija's 'The Joy of Vegetarian Cooking'. Phew!! 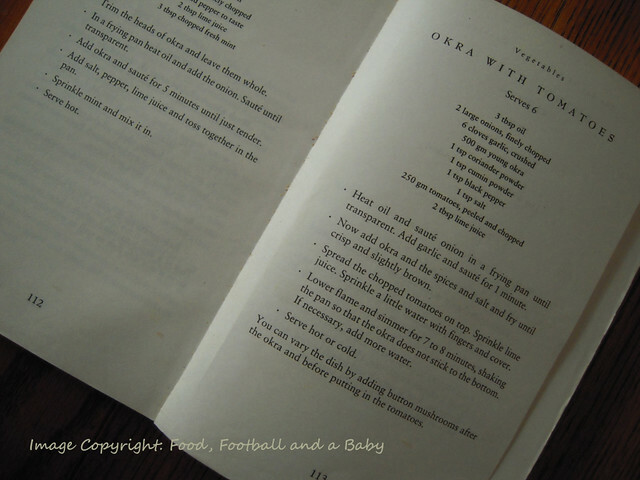 But of course, to make life difficult, I had to go and open up the page to okra. Okaaaayyy!!! Now we do get okra at Safeway or some of the other big supermarkets, but I have found that more often than not its short, not very fresh and tends to be stringy. And stringy, dry okra is Not Good. But luckily, Kay came to the rescue. We had hired a car for the weekend, and we ended up going to 34 Ave, where there are a plethora of Indian stores as well as a big fruit and veg place called H & W produce. We found some lovely, long and fresh okra in one of the stores there (the place was called Satguru Stores). Saved! This recipe is very easy, and literally takes less than 20 minutes to make. And its vegan too. I adapted Jasleen's recipe, as I prefer to cook the tomatoes a bit, and I cut down the oil and spice. But the picture of the recipe is fairly high resolution, so you should be able to read the recipe and make it like she does. We loved this with just some plain rice and lime pickle. A perfect weekday supper. Heat the oil and saute the onion, until lightly coloured. Add the tomatoes and spices and cook till soft, roughly 5- 8 minutes. Add the okra to the dish, and on a low flame, simmer for roughly 5 - 7 minutes till the okra is tender. Sprinkle over the lime or lemon juice. 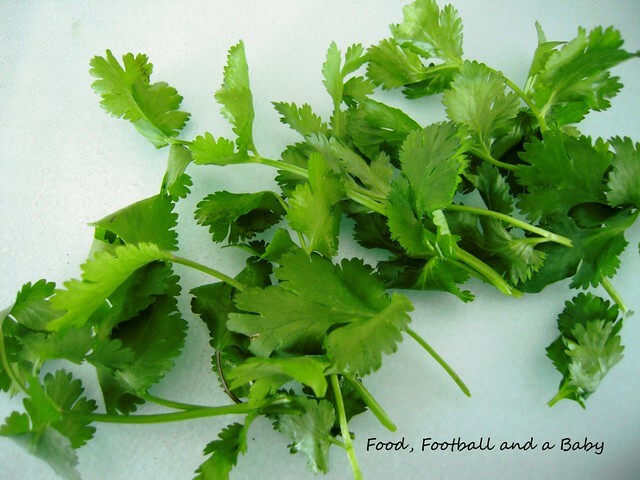 Garnish with the fresh coriander and serve hot with rice, roti or naan. This recipe is linked to Dom at Belleau Kitchen's Random Recipe Blogger's Challenge. oh and fabulous photo's too! Thanks Dom... we get great beef and game here... but sigh!! House of veggies/pescis with me as the lone meat eater. So guess what we cook most of the time? Enjoying your ransom recipes, wonder what you'll come up with next!! 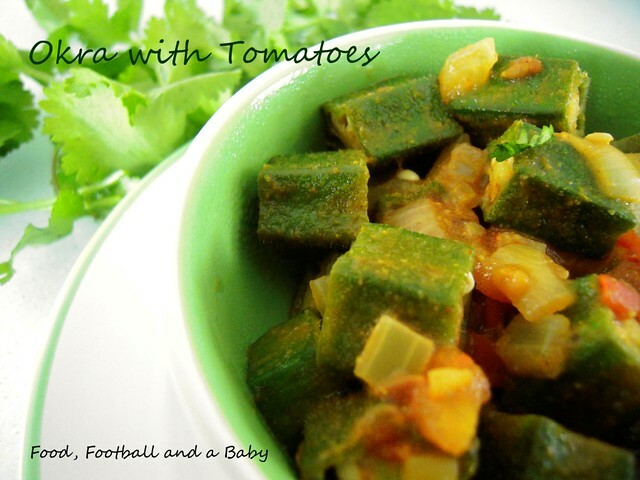 Okra is something I have never tried. I can't even begin to imagine it's taste or texture. Must join in Dom's challenge though. This does look nice but, like a lot of people I know, I really do have a problem with okra. Probably the result of overcooked dishes in bad restaurants - I'll try to pluck up the courage to try it again. @Jac and Phil, okra can be quite slimy, and I think that's what puts people off a bit. However, if you dry the okra thoroughly before slicing, you can keep the stickiness to the minimum. Also, Phil, the best way to make sure that the okra is not overcooked, is to cook just until the stickiness disappears. This will keep the okra tender, but with a bit of a bite, which is much tastier than overcooked okra. We love it here, cooked or fried, so I encourage you to totally try it. So simple and yet so delicious. 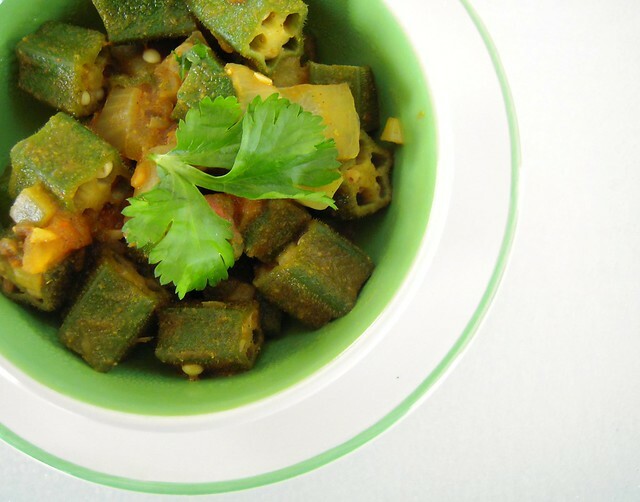 I've made this okra recipe several times and my family loves it. Thanks, Michelle!